It's about time I take a break from pumpkins and squash and give apples their due. I'm just so damn enchanted by pumpkins! Nowadays I still stuff my greedy little face with apples, but I get to bake with them too. 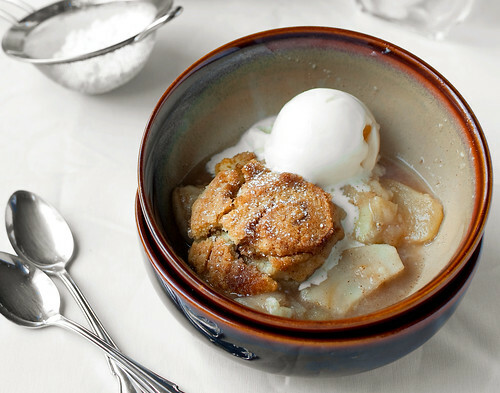 This dessert is a fun play on the traditional cobbler. Part biscuit, part cookie and part cinnamon roll, the pretty little swirls give the cobbler some extra fall whimsy! I like to use a mixture of apples whenever I bake to create some complexity - some tart and crisp, some sweet and juicy. I used Tompkins County King, Jonagold and Macs. The biscuits are quite sweet, so adjust the sugar in the apples accordingly to taste and how sweet or tart the fruit is. 1. For the biscuits: Mix brown sugar, ginger and cinnamon in a small bowl and set aside. Mix flour, 3/4 cup sugar, baking powder and salt in a large bowl. Using a pastry cutter, (or you can do this in a food processor) cut in the chilled butter until a coarse meal forms. Stir in cream and vanilla until moist clumps form. Turn dough out onto a lightly floured surface and knead gently just until smooth. 2. Roll out the dough on a floured surface to a 9x15 inch rectangle. Brush with the melted butter and sprinkle with the spiced sugar mixture. Starting at one long side, roll up jelly roll style. Transfer to a baking sheet, cover with plastic wrap, and chill for at least 1 hour and up to a day. 3. For the filling: Preheat oven to 350F. Lightly grease a 10 inch cake pan or similar sized vessel with at least 2 inch sides. Whisk together the sugar, cinnamon, nutmeg, flour and salt in a large bowl. Add the apples and toss gently until they are evenly coated with the sugar mixture. Pour into the pan and bake for 30-35 minutes, stirring occasionally, or until they have begun to soften and release some juices. 4. Cut the biscuit dough log crosswise into 1 inch thick biscuits. Place biscuits on top of apple filling, spacing evenly. Bake for 45 minutes, or until biscuits are golden and filling is bubbly. Cool for at least 10-15 minutes. Serve warm with ice cream, fresh whipped cream, or hmm even some sharp cheddar cheese! 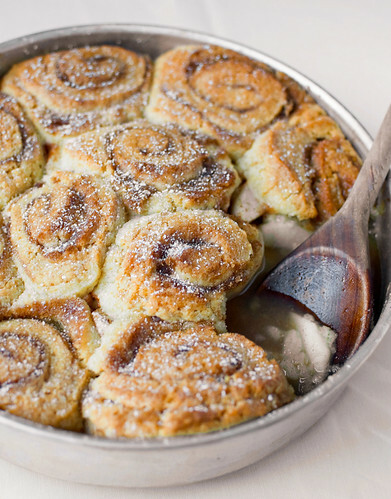 This looks delicious - its like cinnamon rolls and apple pie became best friends. This is such a good idea and looks so delicious! It is impossible to fit 3 and a half pounds of sliced apples into a 10"x2" cake pan. 2 large apples is a more accurate measurement.